Of the Kitten Kind: Apple Crumble- A healthier version for dessert or breakfast. Apple Crumble- A healthier version for dessert or breakfast. Today I am getting frugal. I have been meaning to have a grand savings plan for such a long time, but things like a 1974 Volkswagon Type 3 Square back, a new DSLR, overseas holidays and a fancy new fridge come along and demand my cash. Not to mention all the necessary social functions. I am looking at ways to get real. I think it's time to get financially responsible- only in order that I can buy a house. For no other reason. There is a little old church down by the beach that has been newly converted into a house. It's my dream home. It also happens to be the church that my fiancés grandparents were married in. It would be so easy, if only I had saved a deposit instead of having so much fun. I have been rummaging through my cupboards, remembering what it was like when I was a student. I always had the ability to make something out of nothing and I've been thinking of cheap alternatives that are just as much fun as extravagant outings. You may have read my previous post on how to live a budget conscious vegan lifestyle. I do follow those general rules and they allow me to have a very comfortable and fulfilled time whilst living my little life. And so here I am, on this Friday night. We would normally be out, running around the markets and seeing bands. Instead, I am watching movies on the couch in the warmth of my lovely home which is just as lovely. I have made a firm effort to not buy anything this week and in doing so have made do with what is already here in my cupboards. For dinner, I made Szechwan eggplant with an eggplant, rice and some random sauces and vinegars. For dessert, I made this simple and tasty little number. I didn't take measurements so you will have to bear with me. I can give you approximations but really, you can throw it all in. It's highly unlikely that it won't work out. One apple, peeled, cored and chopped. 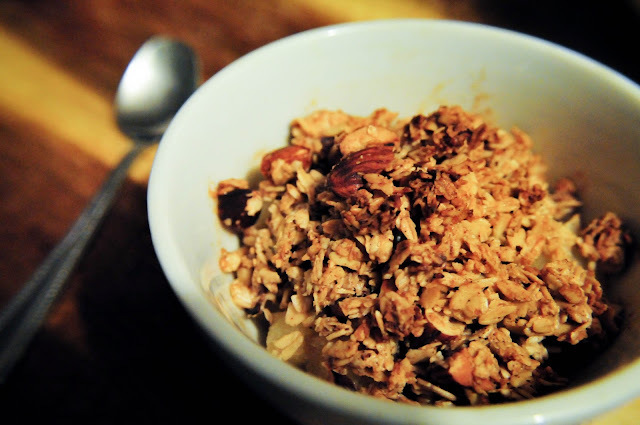 Half a cup of porridge mixture or muesli. I used the one that I featured previously. A tablespoon of coconut oil, melted. A tablespoon of agave, maple syrup or another sweetener of your choice. Heat the oven to about 180C/ 350F. Place the apple pieces into a small, oven proof bowl. In a separate bowl, add the muesli, coconut oil and half of the sweetener. Mix them together well. It will be a little sticky, but not overly. It won't clump together a whole bunch, but just enough. Place the rest of the sweetener on top of the apples. Now, top the apples with the oat mixture and then place aluminium over the bowl. This would also make a great breakfast. The apples could even be swapped with pears or bananas. I'm planning on having this for breakfast in the morning. I loved it. I hope this post makes sense. As always, just have a play, but it should be pretty straightforward.